My horrendous dark circles are well documented on my blog. I'm always trying to find the best concealer to cover them. There are a few things I want from an under eye concealer, first of all it has to have full coverage (my dark circles aren't messing!) I don't want it to crease, crack or fade through out the day. And finally, I want it to look as natural as full coverage can be. So here are 5 that are really amazing and 5 that I don't rate. This is one of my favourite concealers for under my eyes. This is really full coverage and does a really good job at covering my dark circles. The consistency of this is rather thick but it's really easy to blend and look natural. This does crease on me slightly, nothing to bad or enough to make me stop using this. Although this is expensive this pot has lasted me for ages and I've used this exclusively for around 6 months, so I think this does work out to be good value. When I first brought this I didn't love this under my eyes, I didn't find it quite as brightening as I would like. But I brought a lighter shade and I love this now! It offers full coverage in a really light weight blend-able formula. This has a natural matte finish, that doesn't look dry or cakey, it surprisingly looks really natural. It wears so well to, it stays looking flawless for a good 9+ hours on me. I really cant't recommend this enough. Now this Too Faced option isn't as full coverage as I'd like but I love the radiant, natural finish this gives. The formula is quite hydrating, I don't personally find this slips around my face but I don't think it will be for everyone. In terms of creasing this does crease slightly to but that's nothing a bit of powder doesn't sort. I also really like this for highlighting my the centre of my face because the finish is so nice. If you have dry under eyes I think you would really like this. Another concealer I really rate for dark circles is this super cheap offering from Makeup Revolution. This is a really good dupe for the Tarte Shape Tape and comes in a huge shade range. The concealer applies really easily with its Doe Foot applicator and it's really easy to blend in. I prefer to use a Beauty Blender with this because I find it gives it more of a natural finish. The coverage is definitely on the full side. It has a natural matte finish and I don't find this creases or cracks on me. For just £4 this is definitely one to check out. Like the Tarte concealer the first few times I used it I didn't love it. But since I repurchased this and I've been really enjoying it. I'm not a huge fan of the foam like applicator but I can over look the packaging. The concealer is really light weight, it has thin consistency that takes minimal effort blending. It looks really natural under the eyes. In terms of coverage this is more medium to light, but it's easy to blend up to full. I do also find this creases slightly, nothing over the top or bad though. It really brings light to the undereyes and makes the whole area appear brighter. Definitely an affordable option to check out. The ones I don't like. I should probably chuck these out now but for the purposes of a post like this I like to hang on to them haha. I feel like this concealer has dipped of the radar, a few years ago everyone was raving about this. Including me! Don't get me wrong I do still like this concealer I just have found others I way prefer and I just don't reach for this. The formula is so light and really easy to blend. The coverage is medium. But my issue with this it looks kinda dry and cakey under my eyes. Maybe if you don't have dry under eyes you would really like this. This has to be one of my most disappointing products. I was excited to try this. And on first application I did really like this. It gives my under eyes a really flawless, almost airbrushed look to them. Like a blurred effect. I thought I had found my new holy grail. But After maybe an hour of wearing this it turns awful. It cracks and looks so dry! I'm gutted because aside for that this is such a good concealer. I've tried so many different ways of applying this, and with different primer but I just can't make it work. I'm gutted because the finish is so nice. Like I said I like my concealers to have full coverage and this one from Makeup Forever just blends out to nothing. The coverage is so light it doesn't really cover anything. I can get some coverage if I really build this up and I mean like 5-6 layers, it just creases like crazy and moves around, powder doesn't sit well with it either. It's just not a great a concealer. I brought this because I love the All Nighter Foundation so much. I like this on blemishes and other areas of the face but under the eyes this is a no go, for me. It has quite a thick consistency but this didn't pose a problem blending it out, the coverage is pretty full. But this oxidises (like the foundation) so I probably should have brought a lighter shade. I also found this is just far to drying and heavy looking under the eyes. Having said that this does provide long lasting coverage on blemishes. I love Milani as a brand so this is no reflection on I feel about them! But this concealer just doesn't do anything. It's a pot but it doesn't have that thick heavy consistency associated with pot concealers, it actually feels really light to swatch, so I had high hopes. But this just doesn't do anything, there's no coverage at all. When I try to build it up it just blends out to nothing. Which isn't what I want in a concealer. I love Milani but this I just can't recommend. 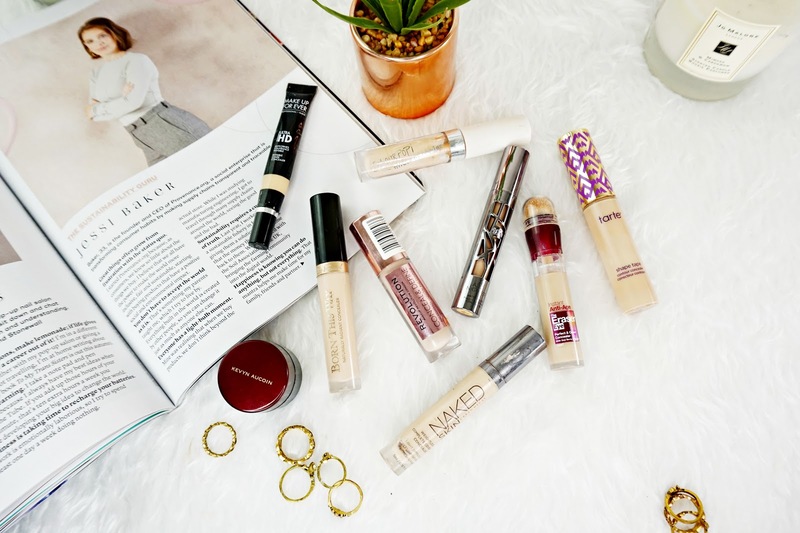 So there are 5 amazing concealers for dark circles and 5 not so amazing ones.